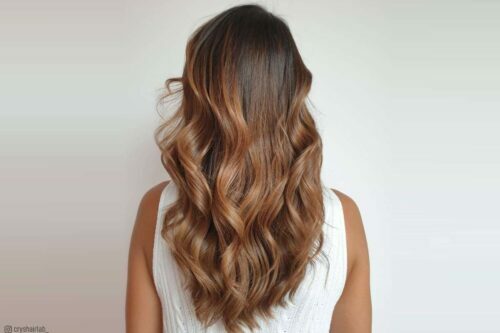 Caramel highlights on brown hair might be just the thing for you to kick your brunette hair up a notch! They add definition to layers and curls, lighten your overall color, and add soft warmth to your look. You can go bold, soft and subtle, or ombre‘ to add that “special something” to your color. Brunettes don’t fret, with all of the caramel options you have, your locks will never look the same. Go dark and rich, lighter and creamy, or multi-tonal. Depth and lightness are not your only options either! Concentrate those gorgeous highlights around your face in a soft ombre’, or go all the way through. Just go for it and warm up your look by trying one of these brown hair with caramel highlights! These highlights are a great way to add subtle dimension on brunettes. My client originally came in with virgin hair and wanted to brighten everything up for the summer and have a haircut with more movement. That’s when I decided to stick with caramel because she didn’t want anything too drastic. At the same time, the balayage pieces would bring out the layers we added to her haircut. In addition to the balayage, what better way to show off the color than to add on some loose soft beach waves. The waves help brings out the dimension between her natural color and highlights and of course is a style that is really in these days! This look is for any brunettes wanting a very easy maintenance look. It’s very natural, so if you’re someone who wants a change but doesn’t want anything too dramatic, this look is the way to go! Caramel tones can start to get extremely warm if not taken care of. Anyone considering this look should definitely consider investing in a color safe shampoo and a blue/purple shampoo to maintain the caramel tone and prevent the color from becoming too brassy. Straight hair or wavy hair? 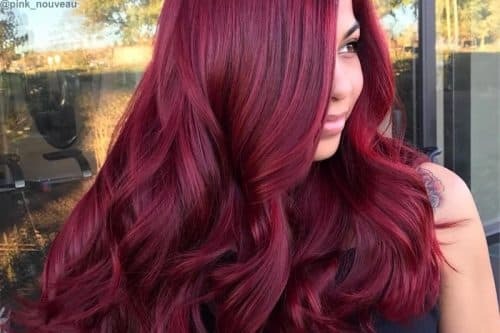 The color is one that would suit any hair type. This color would also suit light to medium skin tones who also have warm undertones. 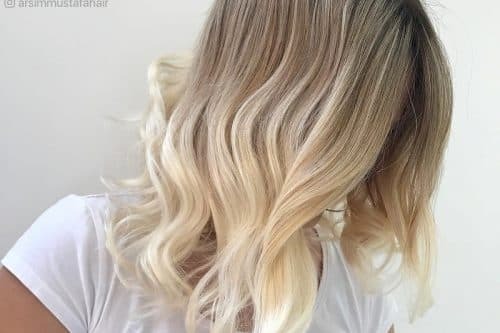 If you’re a client that is afraid of brassiness, I would ask your stylist to see if they can ash out the caramel tone a little, so as the toner fades out, you won’t have to worry about it getting brassy so quick. Natural looking hair color. I love the pop of light on my client’s face. 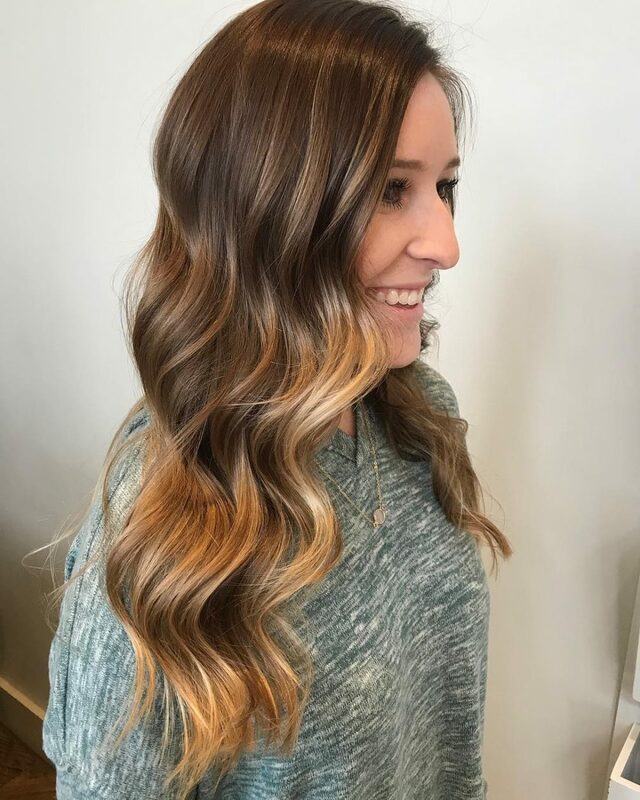 I do balayage highlights with almost all my clients. It’s a great way to go lighter without highlighting the whole head with the traditional foil highlight look. It’s also much more modern. I would recommend this look for any of my clients who are looking for natural looking hair color with natural looking sun-kissed highlights. This is great for a client who is looking for lower maintenance highlights. 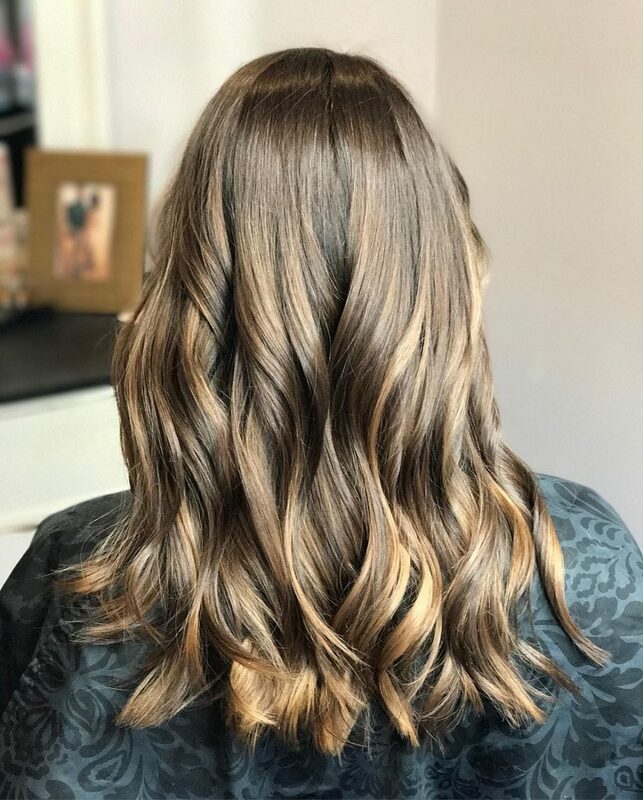 Typically, clients that get balayage only get their hair highlighted every 3-5 months, depending on how fast their hair grows. 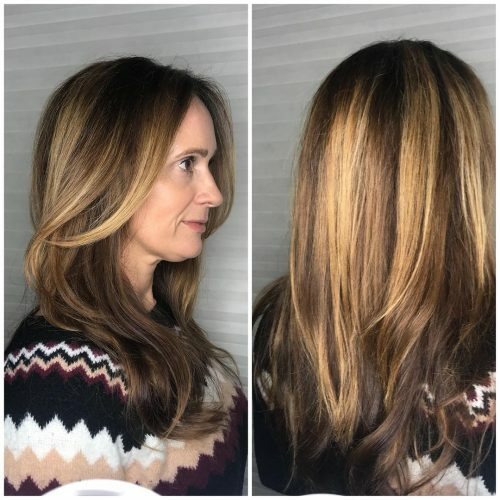 This specific client gets her hair colored every 6-7 weeks for grey coverage only and I recommend every second visit we balayage to refresh her highlights. This look is best for the client who likes the depth at the root and likes a more gradual feathered out highlight. It’s not a traditional more distinctive line that a foil highlight gives which is right at the root. This look is best for our simple/natural client, who’s is looking for a beachy sun-kissed style. This technique works on all hair types/color/face shapes. I styled her hair with Oribe Supershine moisturizing cream (my fav product!). My client has fine hair but it has little natural wave and frizz. This is a product that is good for frizz, shine, it has no hold, nongreasy. So for typical clients today only wash their hair a few times a week, it won’t get greasy. I used a round brush and finished with the same product to smooth down any flyaways and frizz. I consider this look to be a lived-in beachy look. 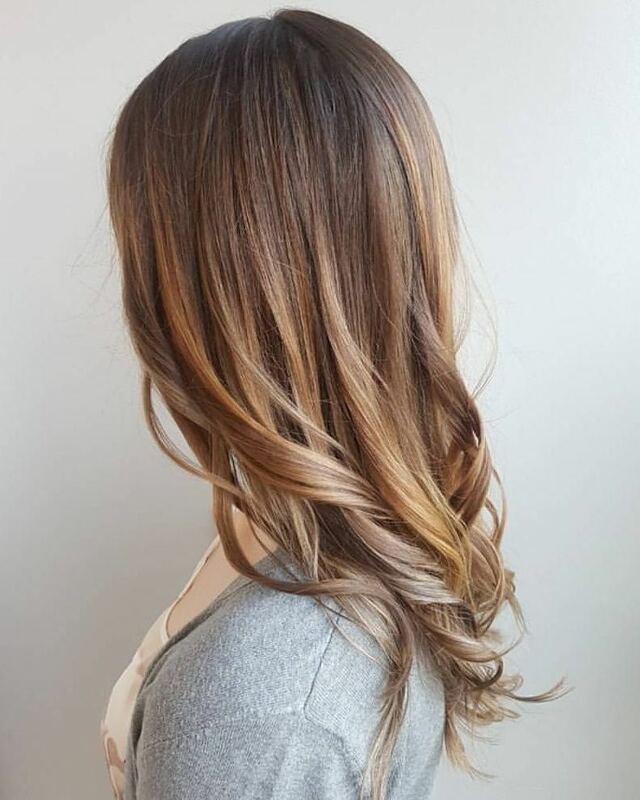 I love the multi-dimensional tones of caramel and how soft it is from roots to ends. The highlights, in this case, are low maintenance. This particular client would need her roots touched up every six to eight weeks. At that appoint, ent I would also refresh the ends with a toner. I would then suggest she come back every four to six months to refresh her highlights. In a case of lifting the ends, I always recommend LOréal Smartbond which is a product that has the ability to protect and strengthen the hair through the lightening process. For styling, I used LOréal Professional Techni-Art Full Volume Mousse with Kerastase Elixir Ultime Oil for shine. I used a GHD soft curl tong with their curl hold spray and gave it a soft comb-out with a wide-tooth comb, finishing it off with a working hairspray. I feel that this look is for everyone. It is as low maintenance as you would like it to be, but refreshing it every couple of months keeps it looking polished. 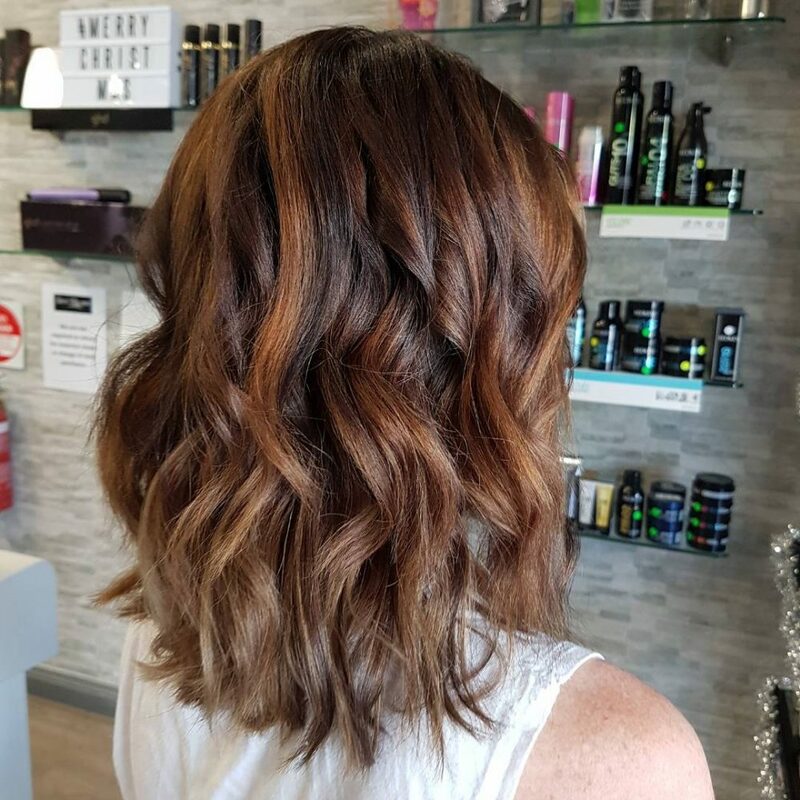 The soft and the beachy look is on-trend at the moment, so this look is perfect for any brunette that just wants to add more to their current look. I absolutely love this look because it’s so soft and subtle that it almost looks natural. This look takes me back to a time when we were kids in the summer with that natural, sunkissed halo on top. I love balayage, however, it’s not for everyone. This was a lot of painting on top of the hair, which looks wonderful straight, but the curl is really what shows off that natural lowlight from underneath. Consider your best look with some sort of texture. The cut is perfect for that fun beach wave and requires nothing but some heat protectant, texture spray, and a little hint of hairspray. Unless you have some sort of frizz, I would blow dry it out with a smoothing product and go back in with the same tactic. I would describe this look as a perfect “pick me up” look. It is something subtle yet noticeable to feel like you got a change, but didn’t go too crazy with it. My favorite thing about this look is how it blends perfectly with her natural color and gives it that pop of sunkissed lightness! Highlights aren’t for everyone, but when done right to get them to blend naturally with the hair, anyone can rock them! 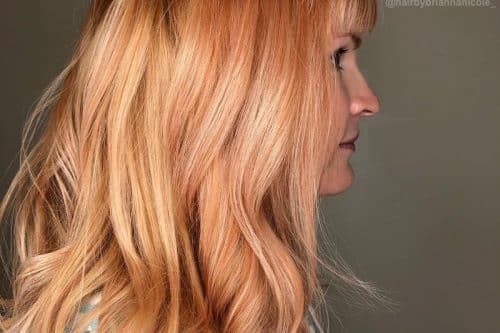 There are different techniques to make the highlights naturally grow out beautifully so you don’t have to get them touched up every month if you are on a budget. As for products, I recommend a good leave-in conditioner because we did lighten the hair and naturally it could be a bit dryer than it was before. I personally like Miracle 20 by Matrix because it’s not too heavy, but leaves the hair super soft and hydrated. If your hair is very damaged, I would not recommend highlights as they would just be more damaging. 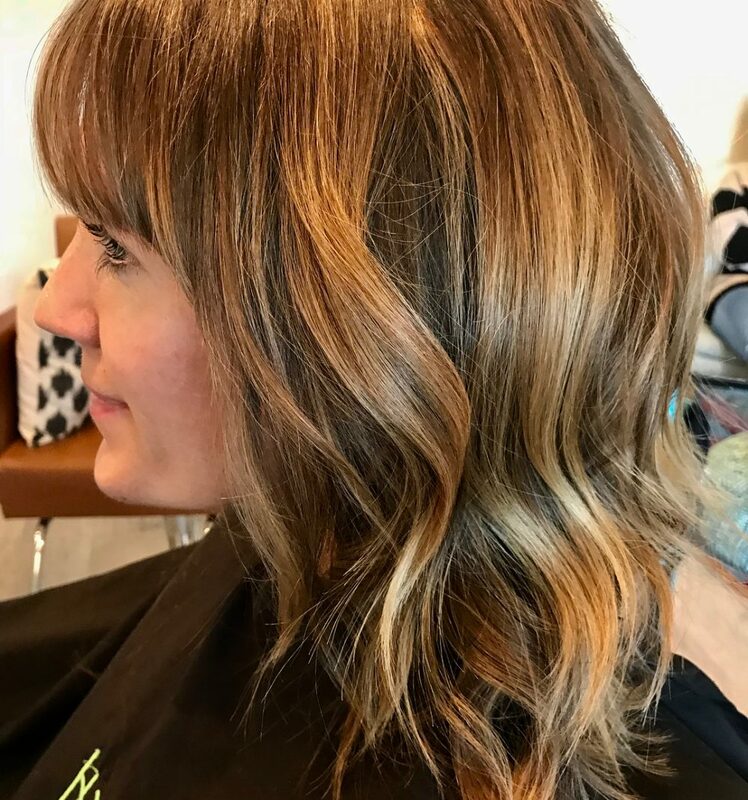 Highlights give the hair more definition and depth and are perfect for someone who needs something new, especially with the new seasons coming up! Highlights would be the perfect glow for summer. This guest has a short textured bob. Both shears an razor were used to achieve the look, followed by a foil balayage. My preference for toning natural brunettes is to keep the rich caramel tone not far from natural level. My favorite thing about this look is the organic feel of this natural beauty. The placement and texture appear just as if she has been at the beach all summer. When a guest shows me inspiration pictures of a look such as this, I always like to explain the at-home maintenance required for daily care. I like to start off with the importance of a sulfate-free shampoo, as well a moisturizing treatment, ideally used once a week. Depending on the level that the hair is lightened to, a violet-based shampoo is a great way to keep the color fresh in between visits. The best part of a look like this one is that the maintenance is very low. Seven to eight weeks is the perfect timing to pre-book for a haircut and toner. The lightening process is not needed at every visit. I recommend every other visit for a full process. 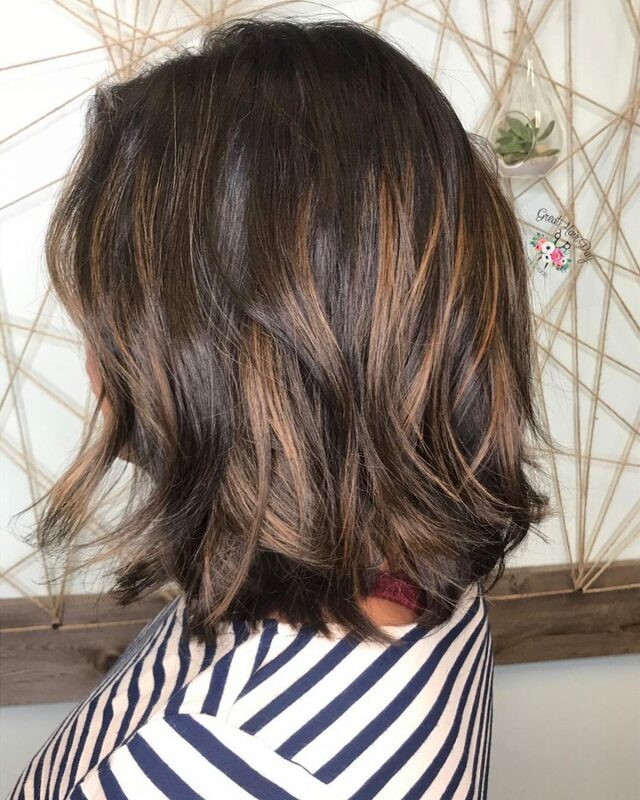 If you are considering a caramel balayage textured bob, I recommend asking yourself if you are ready to do your “homework” and do your part to care for your hair in between salon visits. This look is soft yet subtle. 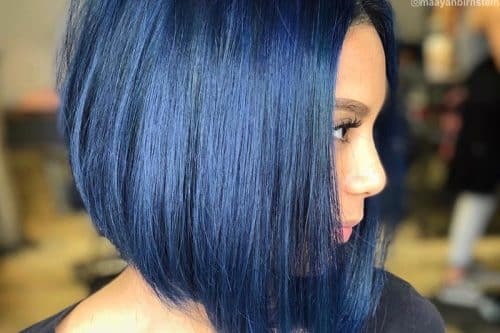 It is classy and sassy with a pop of color, and perfect for anyone who wants a little change without going drastic. Baby steps! I use Wella hair color, Oligo Professional bleach, and Olaplex for healthy processing and healthy hair. This look is easy to maintain, especially for someone who doesn’t color their hair often. The caramel swirl is a perfect blend of natural with a pop of color. A few babylights give it added softness, making it perfect for any brunette or anyone who wants a change without lots of maintenance! I’d describe this look as a subtle dimension. My favorite thing about this look is that it appears effortless. It grows out so nicely and is just enough for a winter look. This color looks amazing with a soft wave in it. I recommend a 1 1/-inch curling iron and Redken Control Addict for curling. After curling, pull your fingers through the curls with a little Redken Diamond Oil. This look is really great for all face shapes because it falls below the collarbone. I would describe this look as a beachy caramel balayage. My favorite thing about this look is the beachy waves. It brings the whole look together and is so soft, but textured at the same time. This look is very versatile and you can wear it anywhere. This color is a great way to transition from a dark brown into a lighter shade without too much effort and maintenance. It breaks up color without too much change. My advice to a client wanting this look is that they are most likely not going to wake up like this, so products and hot tongs will be your best friend. The look does take a little bit of time to achieve, but can also be done quickly once you get the hang of it. If you’re active and have minimal time to style, this look could work for you! Heat sprays, a sea salt spray, and a volumizing mousse are great products to help achieve this look. A curling wand will give the messy, loose and soft waves. Redken is my go-to brand! This look is very dimensional and soft, but still has that dramatic “WOW” factor! My favorite thing about this look is how the blonde brightens up the client by going a little heavier with the lightness around her face. My best advice for this look would be to consider your hair texture. This look has a lot of dimensions which in turn creates more depth and a thicker appearance. This is great for someone who is looking to enhance their fine texture. 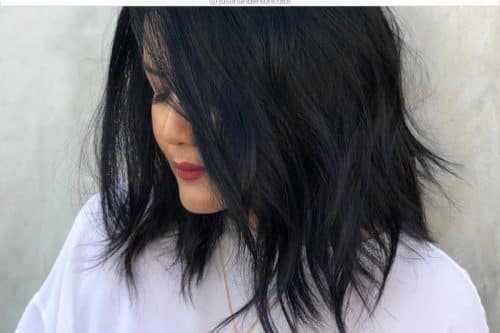 This look is especially great for anyone who wants to be lower maintenance with their color because you are not committed to being in the salon chair every six to eight weeks getting retouched. The blonde is carefully placed just far enough off the scalp so it grows out effortlessly without any noticeable outgrowth. It’s perfect for that college student who wants to have great hair without a lot of upkeep, or for a busy working mom who cannot find time to be in the salon chair as often! If you are considering this look, you want to make sure you are able to recreate the style at home. Having the right products helps intensify your color and the look you are trying to achieve. Products you cannot live without if you are considering this style are Sebastian Eruptek and Wella Sugar Lift. Apply a small amount of the Eruptek to wet hair all over. It makes the hair more workable once it’s dry and adds just enough grittiness so the hair is more suitable for curling. Apply the Sugar Lift after styling to get that textured beachy look. This hairstyle is perfect for the fall season. 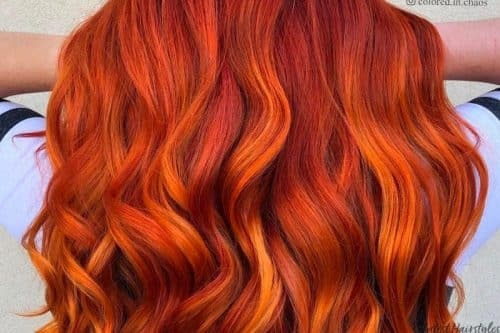 The hair color includes multiple warm tones. My favorite thing about this hair color is that it matches the colors seen throughout nature during the changing of the seasons. Mocha is the base color, then copper and caramel tones as highlights. The soft waves from this look make it easy to recreate using the right products and styling tools. The haircut was created so that it could be styled with a natural wave, straight, or styled with a curling iron. Here I utilized the natural wave by spraying Redken Fashion Waves on damp hair before blow drying. After the hair was dry, I loosely curled the front and top layers with 1-inch curling iron, finishing with a spray of Redken Wax Blast. For the color I recommend Redken Chromatics hair color and Shades eq gloss. At home, the client should maintain the color using a sulfate-free shampoo and conditioner such as Redken Color Extend Magnetics. Any client that wants low maintenance hair color and style is the perfect candidate for this look. I made her base color match the same level as her natural color and added mocha to warm up her natural color. We utilized her existing highlights by adding copper lowlights and toning the rest with a caramel shade. These tones work great for clients that have a neutral or cool undertone in their skin. As the color grows out, there won’t be much contrast with the hair color and regrowth. That makes this the perfect color for someone with a busy lifestyle. The style will work great for anyone with wavy to straight hair. I️ would describe this look as low maintenance, warm and natural. I️ love that this look has contrast and depth, but is still such a natural blend. Too much dark or too much light can sometimes wash out a person’s skin tone. Staying close to their natural base color with some pops of a lighter tone that is two to three shades lighter can balance very nicely. When styling this look, I️ love to use a styling cream or a light root booster to hold the styling and create volume. I️ round brush the hair and add some soft curls to help define the color even more. Finish with your favorite texture spray for separation and hold. I️ am absolutely obsessed with Living Proof Prime Prime Style Extender, as well as the Dry Volume Blast. This look works best and would be a great idea for someone that wants something low maintenance. I️ can touch up regrowth/grey coverage for several months before touching the highlights. It could honestly work on any hair type. The warm tones in this color work best on someone with medium colored skin. Go above and beyond with this truly lovable blonde lush waves! 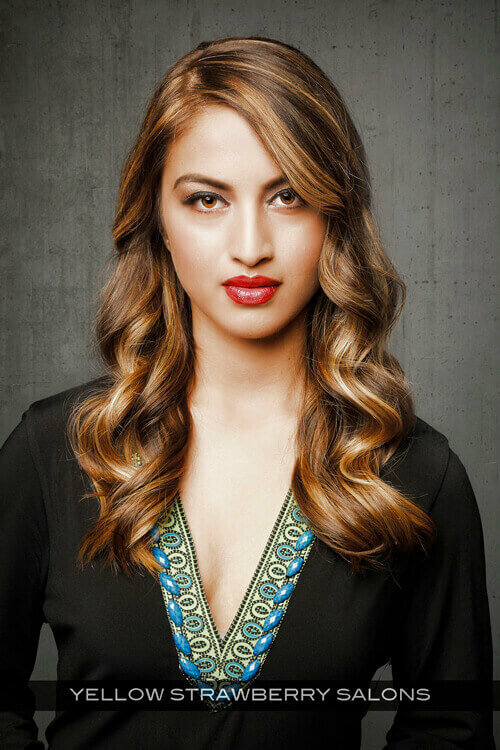 An enticing trick to make it more interesting is the addition of these delicious caramel highlights that can accentuate and brighten the waves. This is a foilayage that I created on a client with virgin hair. It’s a soft look that I blended with a hand painting technique rather than straight up highlights in foil. My favorite part of this look is the warmth! Nowadays clients tend to fear warmth because they believe their hair will appear brassy. This is not true. If it’s done right with the correct use of product and technique from start to finish, it will look amazing! 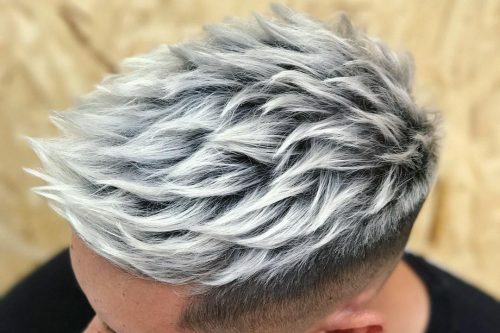 There are many ways to achieve this style. Depending on how much body you desire (who doesn’t love some volume!?!? ), I would definitely go in with a thickening product before blow drying. I used bumble and bumble thickening spray, but whatever you prefer is will work just fine. After I finished round brushing, I went in with my 1 1/4-inch Babyliss curling iron and created a soft curl. I then finished off with a light hold spray to keep the curl. 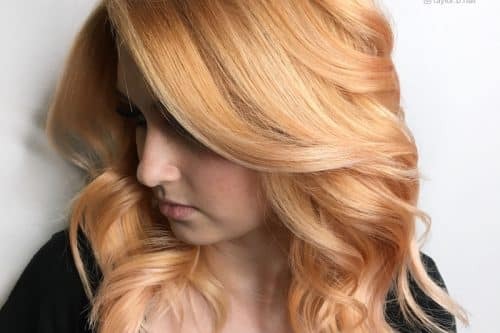 To maintain this fabulous color, I recommend coming in about every two months to refresh the caramel with a toning service. This is a great way to renew your look without paying the cost of an entire foilayage. Another option is to bring the caramel tones up higher with a partial foilayage/balayage after the new growth becomes too long. 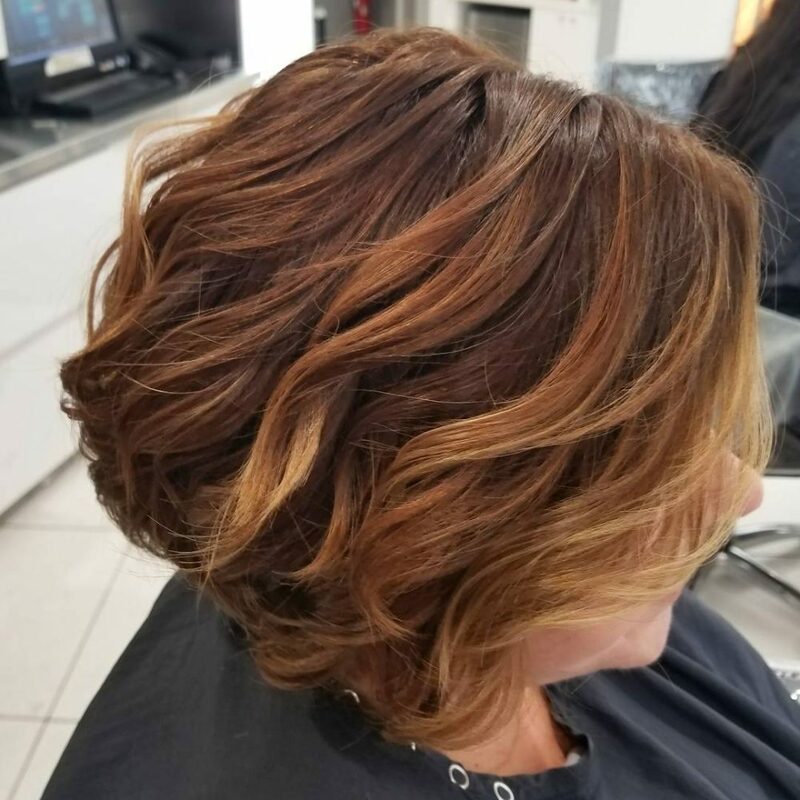 This type of creation is perfect for those who can’t commit to coming into the salon every six weeks for a color retouch. 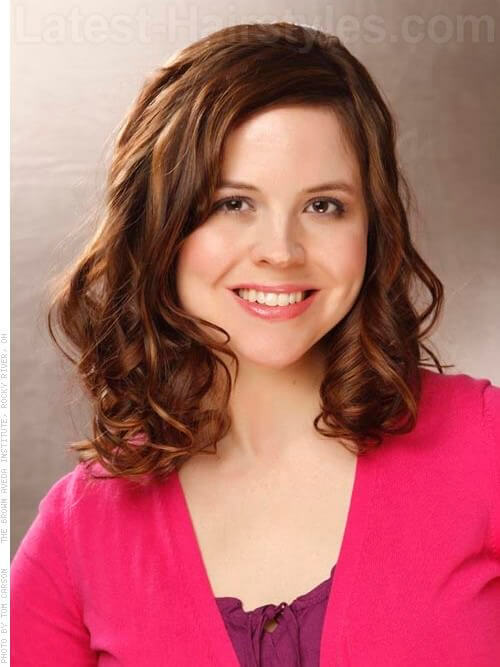 Another great candidate for this color is one who is transitioning from a darker brown and wants to slowly go lighter. This is a beautiful “in between” shade with tons of dimension. Whether you have skinny or thick hair, this look would be gorgeous on anyone with golden undertones in their skin. It’s all about placement and how light or dark you choose for those caramel accents. 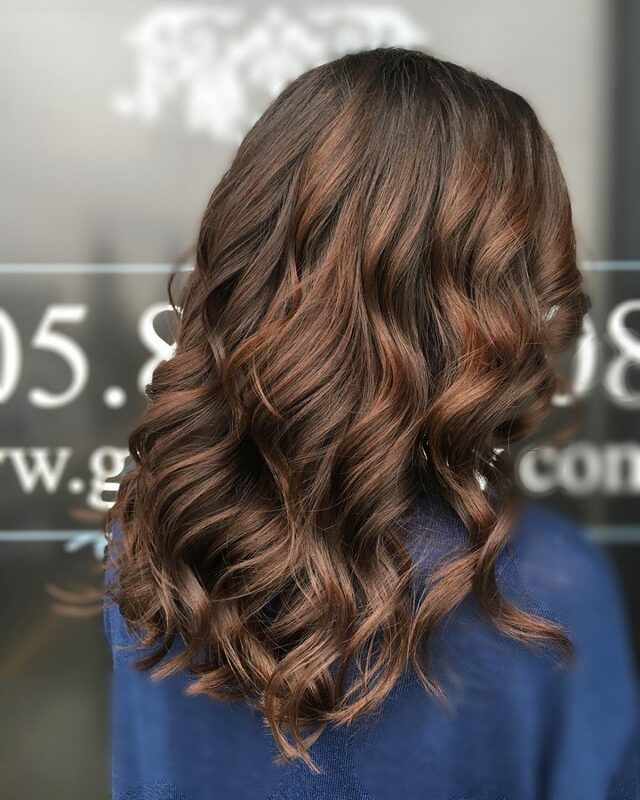 Ribbons of vanilla caramel highlights through a dark mocha base gives lots of texture and interest to long and short hair alike. Medium skin tones that look great in pops of blues, violets and magenta wear this color well. Hair that is medium to dark brown naturally is a great starting point to achieve this look. If you have colored or very dark brown hair, getting this soft vanilla caramel highlight may take more than one visit. Be patient! Your stylist is interested in keeping your hair healthy and looking great, and sometimes that takes a few visits. Adding highlights under a chocolate base gives texture and definition and makes this amazing cut pop even more! Light to medium skin tones that look great in plum, navy and emerald greens look amazing wearing this color too. Hair that is straight in texture and naturally medium to dark brown is the best base for this color and cut. Keeping a small amount of brown to overlay your new highlights makes upkeep a breeze. 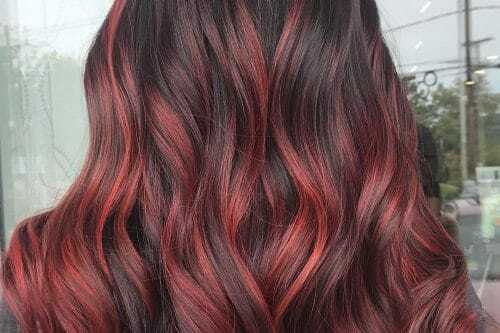 Ask your stylist if this will work with your next color! Soft highlights throughout your hair, with some extras framing your face, create a soft and beautiful golden glow. Light to medium skin tones that have a warmer tone looks great in this glowing caramel color. Hair that is medium to light brown (naturally or colored) is the best starting point to achieve this color combo. Make sure you talk with your stylist about the end result you want to achieve with your highlights. Bringing pictures in (on your phone or printed) gives them a better idea of the color your looking for. Softening up an ombre’ with fine highlights closer to the scalp is a great way to switch up your old color and make it a little more modern. Ladies who tend to look better in warmer colors (think yellow, brown and orange) tend to look fabulous in this caramel shade! 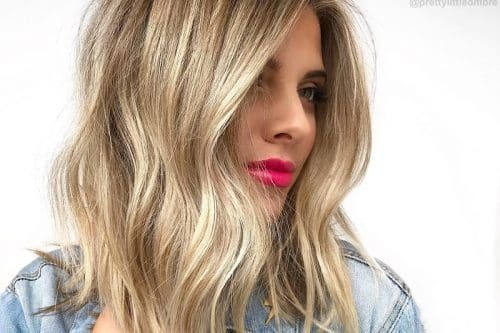 Hair that has some length to it makes for a more dramatic effect when it comes to ombre’, but anything past your chin has the possibility to achieve this color. When lighting the ends of your hair, you want to make sure that you give it the little extra TLC. A weekly conditioning treatment is a must! Try Pravana’s 60 Sec Treatment. One minute in the shower and your hair feel fabulous and you’ve added the extra moisture and nutrients it needs! 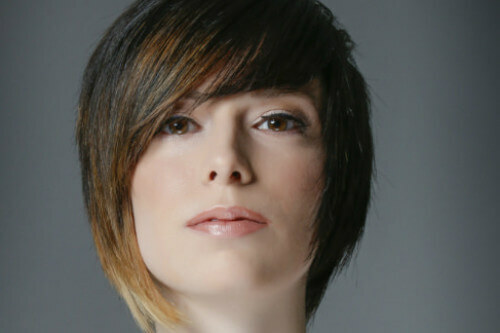 Accent your eyes and cheekbones with these gorgeous face framing highlights and fun haircut. Light to medium skin tones looks fabulous in these face framing highlights. Hair that is medium to fine in amount and straight to wavy will achieve this cut best. f your natural color is light to medium brown, you have the perfect base! Ask your stylist for styling tips. We sometimes forget to give you different ways to wear your new cut and color! You’ll be surprised at the ideas we can give you, as well as product recommendations. Soft, medium-toned highlights look amazing ribboning through rich chocolate brown hair. Keeping them separated gives curls lots of fun and interest too. Medium skin tones that look great in warmer colors wear this rich shade best. Hair that is already a rich chocolate color is a great starting point to achieve this color. Caramel is one of those colors that everyone has a different idea of exactly what it is. Make sure to bring a picture to your color appointment to ensure you and your stylist are on the same page! 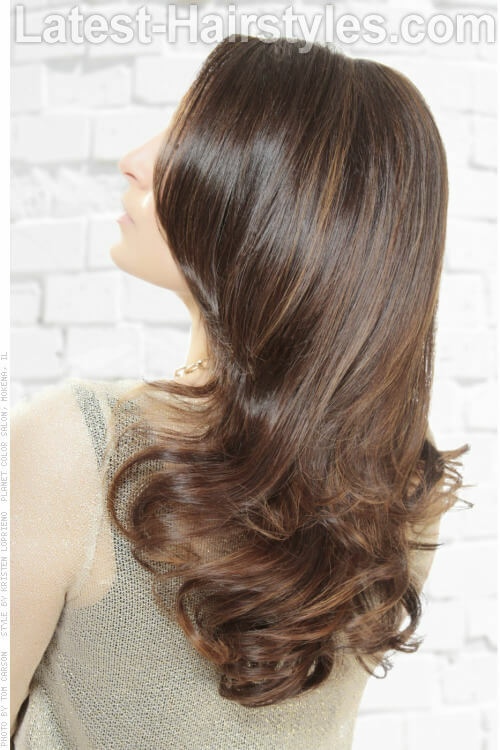 Soft brown hair color with added caramel accent highlights brightens the face and is a perfect year-round color! 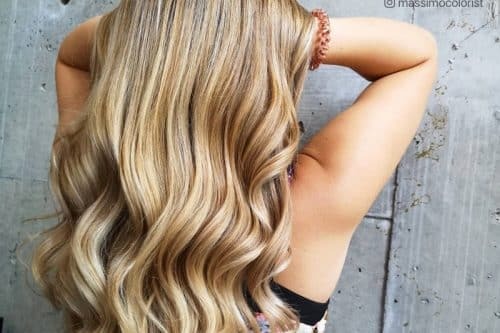 Lighter skin tones look best in this softer color, while hair that is starting a blonde to light brown is a good starting point to achieving this color. 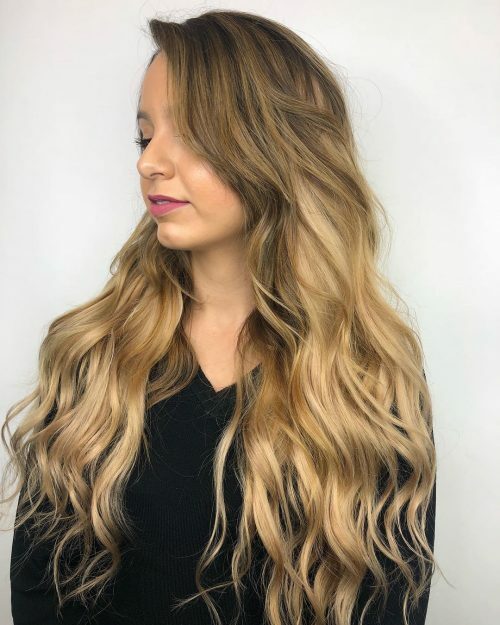 If you are going darker with blonde hair to this rich caramel hue, it is important to ask your stylist for the right shampoo and conditioner to keep your color. A lot of shampoos will quickly pull fresh color out of previously blonde hair. Sulfate-free, color safe shampoos are a must! Naturally, sunkissed is how I would describe this warm caramel balayage. From its loose beachy waves to its pops of color, this look expresses a natural beachy glow. A benefit to this color is its soft blend at the roots, which allows the option for low maintenance. What I love about this look is anyone can pull off these textured beachy vibes with ease. 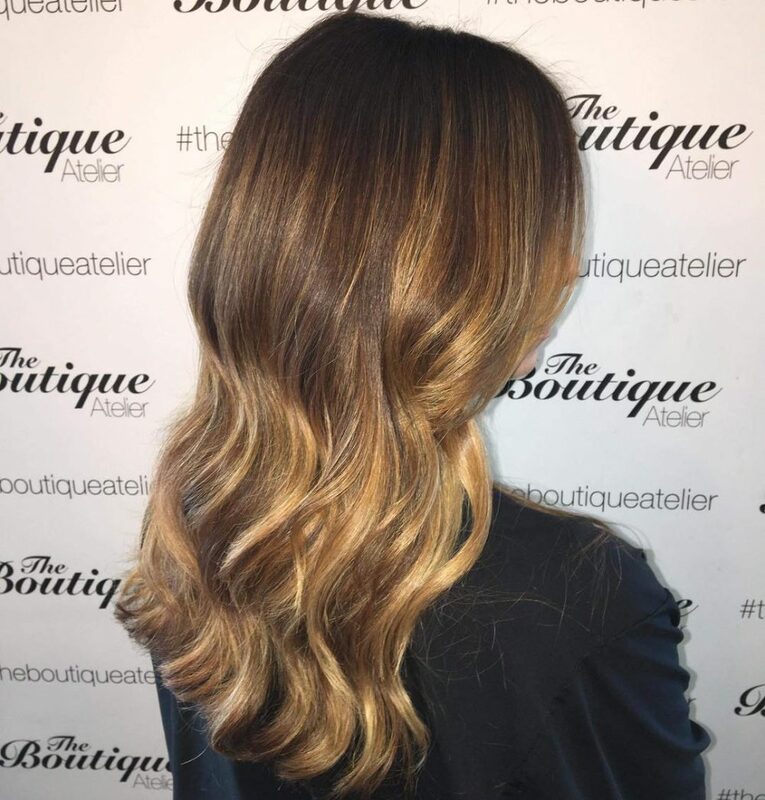 The warm caramel balayage is great for brightening up your hair for the summer while keeping everything soft. When I picture this look, I think anyone can rock it! Anyone can carry this cut and color as long as you maintain this daily. The process is simple – a light curl and a little hair spray are all you need to get the show on the road. I feel that for most woman, time is something we are all up against, which is what makes this look so ideal. It can easily be replicated on a daily basis, ten minutes tops. Another bonus to this look is the natural roots which minimize the visits for maintenances, therefore, your color can last for months without having to return for touch-ups. Despite our age, race, and culture, this look not only will work for you but will also keep you trendy! Adding multi-tonal caramel highlights to brown hair adds richness and dimension that commands attention! 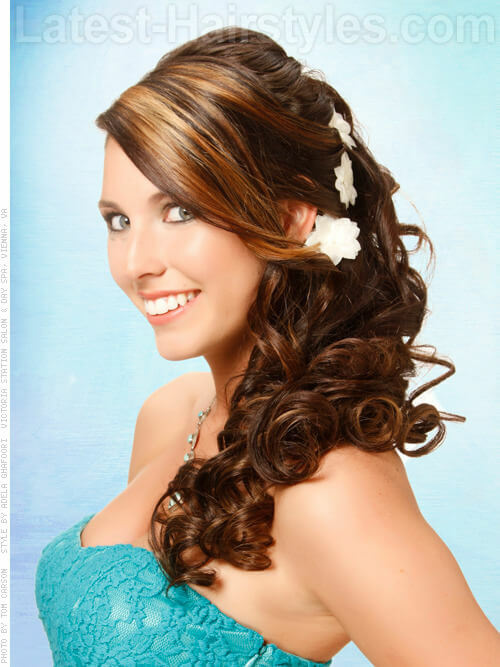 It looks great curled, straight or pulled up as seen in this formal style. Light to medium skin tones looks best in this multi-dimensional hue. Hair that is starting at a light to medium brown makes it easiest to achieve this color. Bringing a picture into your stylist is one of the best ways to get exactly what you’re looking for. Make sure you discuss what your idea of caramel is. It varies sometimes from person to person of exactly how light, dark, or warm caramel should be. 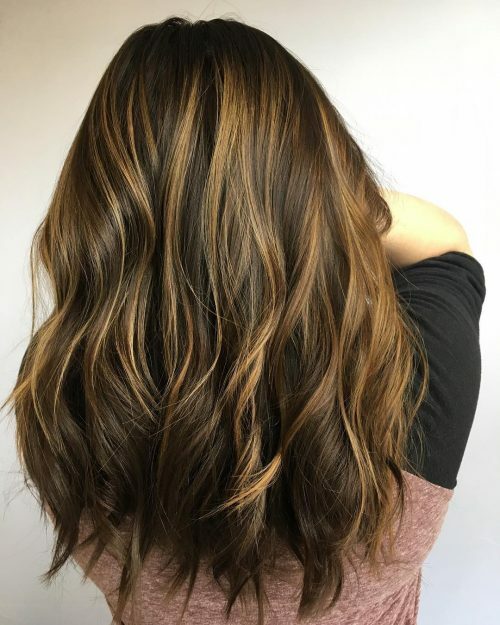 These soft and rich caramel highlights are created using a painted on, or balayage, technique. It produces such natural-looking highlights that you’d swear the sun did them! 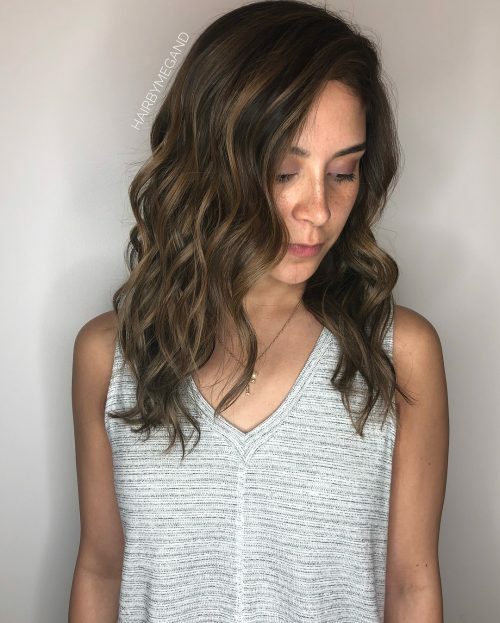 Light to medium skin tones look great in this hue, and hair that is starting off at a medium brown is a perfect starting point for these balayage caramel highlights. Not all stylists are up on how to achieve balayage highlights. Check out their online reviews, Facebook pages, and Instagram to see what kind of hair they are putting out. Also, a consultation before your appointment with a new stylist is always a great idea! Lots of fun, warm-toned caramel highlights brighten this flipped-out look, giving the skin a warm glow! Medium skin tones that look great in warm colors wear this color nicely. Hair that is currently a warm brown is a great starting point for this caramelized look. The caramel pictured is a warm caramel. Talk to your stylist about how golden of a caramel he or she has in mind to make sure you are both on the same page. Pictures are a great way to make sure you both are thinking the same color! 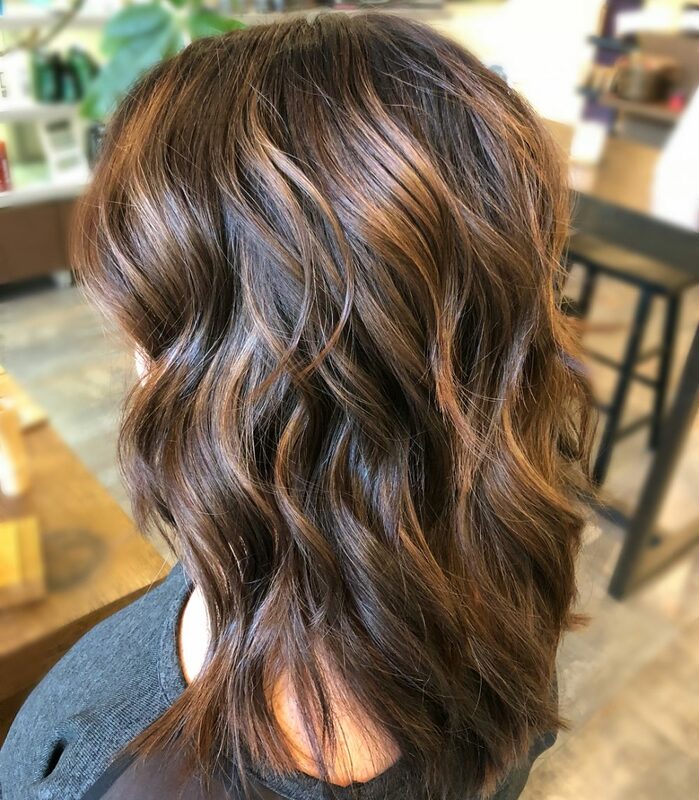 Warm chocolate brown with fine and rich caramel highlights creates a beautiful color that looks fabulous on almost anyone! Be ready to accept all the compliments that come with this color. Light to medium skin tones that can wear a rainbow of colors looks amazing in this warm tone. Hair that is beginning at a light to medium brown is a perfect backdrop for these rich caramel highlights. Love her volume? One of my favorite tricks is to use dry shampoo at the root in the areas you are looking to pump up. Simply style hair, spray a small amount in root area, and give it a slight backcomb with a brush or comb. My favorite dry shampoo is Pravana’s Fresh. Dark rich brown flowing into a soft caramel is one of the hottest colors in Hollywood these days. It’s great for stretching color appointments and staying right on trend at the same time! 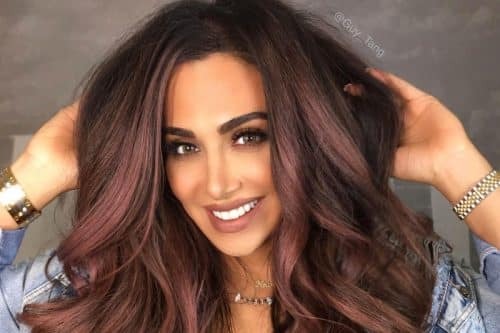 Light to medium skin tones with warm undertones looks great in this hot ombre, while hair that is strong and healthy is a great starting point for any ombre’. Strong ends can handle the lightening and toning process. 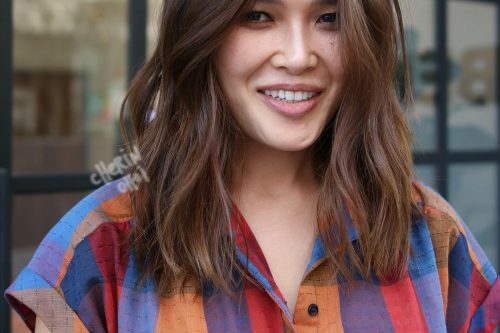 To keep the blending line soft, ask your stylist to give you ombre’ highlights. This keeps the transition from being a straight line. Warm deep caramel woven through chocolate brown gives shine and life to any head of hair! Light to medium skin tones that look great in warm colors wears this color beautifully. Hair that is starting at a medium to light brown is a perfect setting for these warm caramel highlights. Keeping hair color looking great involves a professional sulfate-free and color safe shampoo, regular appointments, and weekly conditioning treatments. Consult your stylist for their personalized recommendations for you. If you want to keep it on the dark side, this is the color for you. The overall hue stays dark, but still has the richness of warm caramel. 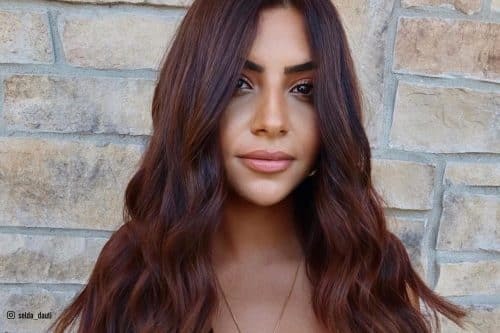 Medium to darker skin tones looks best in this darker look, while hair that is a medium brown to start with is a great beginning point to achieve this color. Keep your hair looking great with regular trims! A dusting off the ends every eight weeks will do wonders. Ask your stylist if they offer memberships or have any specials if you book ahead. Silky caramel highlights laced through light brown strands creates beauty and definition to everyday hair. Whether worn in waves, curls, braids or simply straight, your hair will thank you! Medium to dark skin tones looks wonderful in this rich warm hue, while hair that is starting from a dark blonde to light brown is a perfect starting point to achieve this color. If you are starting at a lighter color and going darker, prepare yourself to be shocked. It always seems darker than what you thought! Give it a few days (and a couple of washes) and you’ll be happy you went for the change. The darkest richest brown with subtle dark caramel highlights makes this color scream beautiful! Warm, dark skin tones wear this color wonderfully, and hair that is naturally dark brown is the best starting point to create this look. Don’t forget to use a weekly deep conditioning treatment to keep your darker tresses rich and shiny. Alternating different shades of caramel highlights through warm chocolate brown strands creates so much interest and texture within the hair! Light to medium skin tones that look great in warmer colors wears this shade well. Hair that is healthy and starting at a medium to dark brown is a great base for these rich highlights. 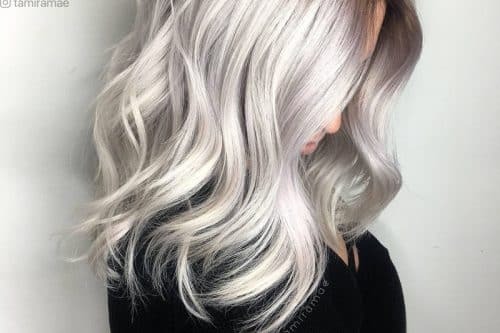 When looking to achieve this color, you will only need to ask for a partial highlight. This will bring lightness around your face and through the top of your head, leaving the depth and darkness underneath. A concentration of beautiful caramel highlights around the face brightens your overall look and is always in style. Light to medium skin tones that look great in warmer blues, greens, and oranges look great in this bright caramel highlight. Hair that is starting at a dark to medium warm brown is a perfect canvas for these face framing highlights. Love her curls? The best curl-staying tip I have is to use a medium hold gel or mousse before blow drying hair. 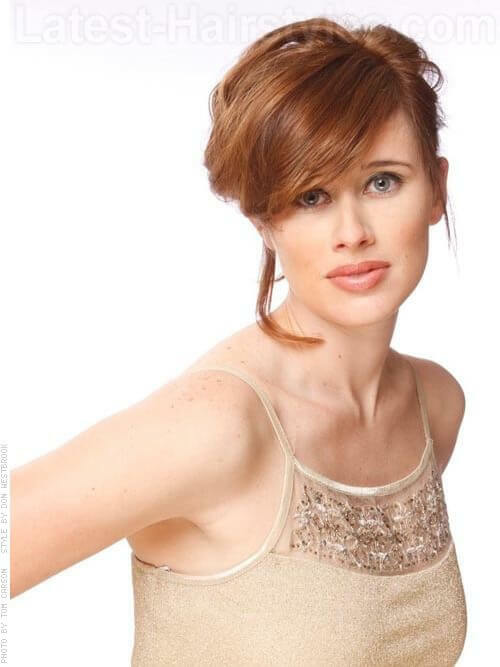 Let curls cool completely before you manipulate them, and don’t go overboard on the hairspray. Too much hairspray can weigh down curls, causing them to fall out! Light caramel highlights through the ends that softly work their way up towards the scalp is easy to maintain yet oh so fabulous look! 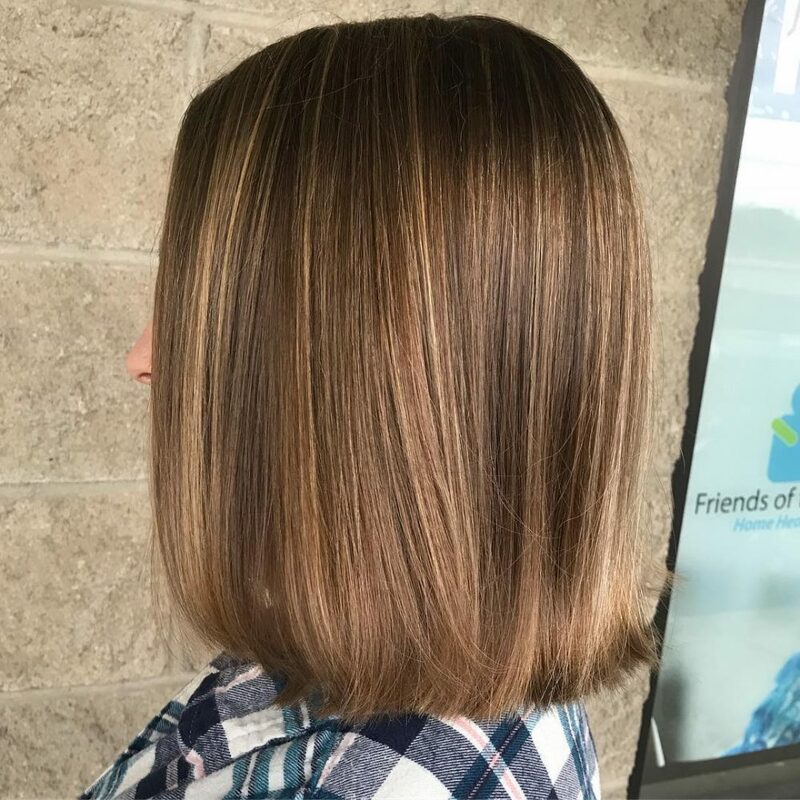 Light to medium skin tones that look fabulous in warmer tones wear this color beautifully, and hair that is rich dark brown to light brown can achieve these gorgeous highlights easily. Don’t overdo these soft highlights! They are meant to be subtle. Talk to your stylist and bring pictures to show how much of the highlights you are looking for.